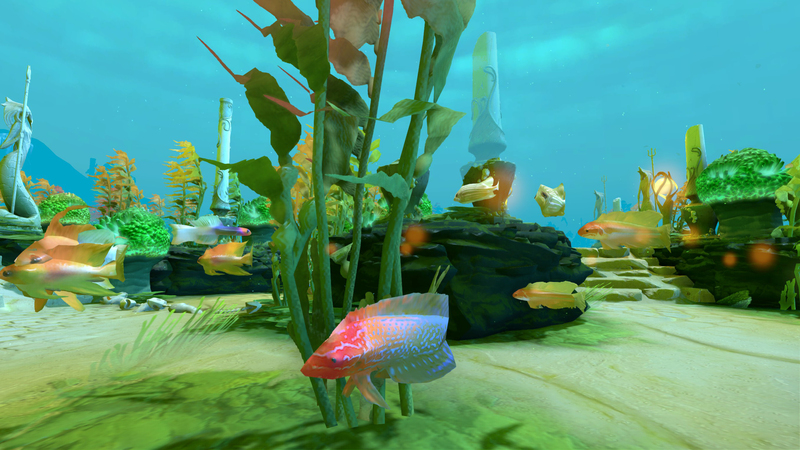 Dota 2's underwater terrain has some gorgeous wildlife! 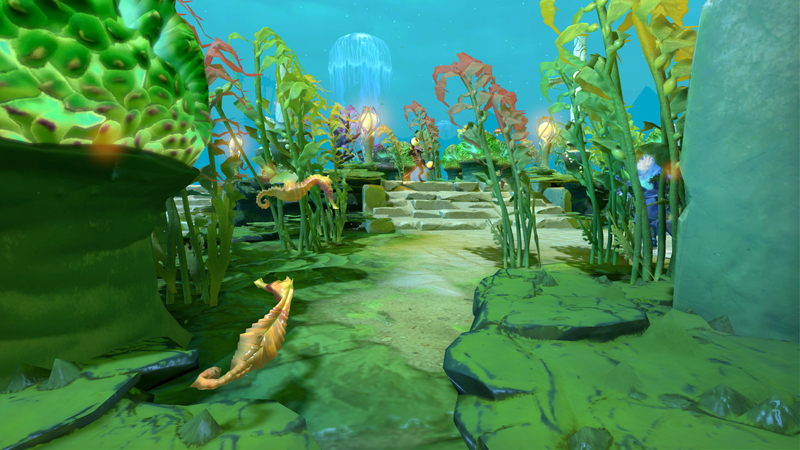 Remember how Dota 2’s current seasonal Battle Pass/money pit has an under the sea theme? 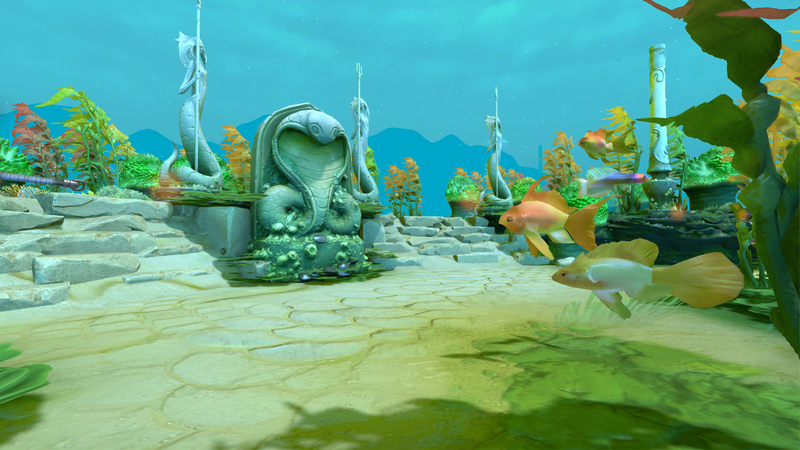 WELL, my Battle Pass is now sufficiently levelled up that I can swap the usual map with its trees and woodland wildlife for an underwater variant called Reef’s Edge! 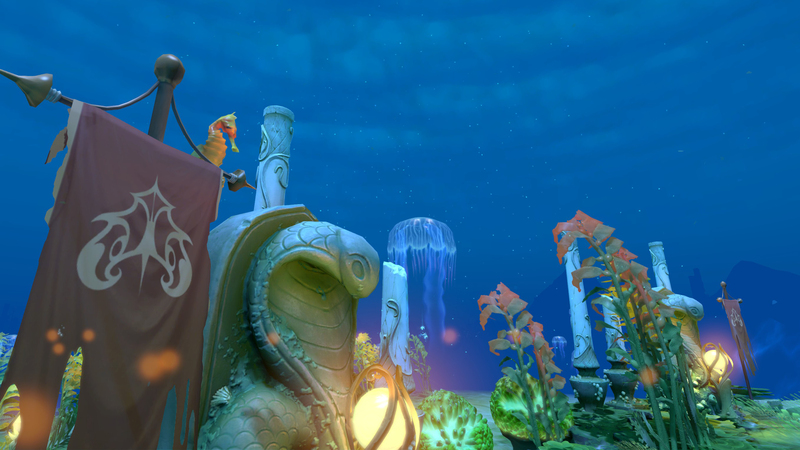 After booting up a game replay I swapped to the free camera mode, ditched the HUD elements that were getting in the way of my watery tourism and went exploring. Seahorses, eels and clams were just some of the things I found! Come see! To navigate the gallery use the left and right button or stick with the arrow keys on your keyboard. Clicking the image itself should give you the larger version. If you’re interested in the creatures which normally wander the map I did a little nature tour as part of the Dote Night column. I should also add that here I was focusing on the more mobile or obvious lifeforms. There are also shells, anemones, kelp, multiple types of coral, starfish and other bits and pieces which I could have included but it would have made the feature balloon because I could take pictures of underwater game stuff for HOURS. The seahorses are my favourite, I think. Their animations are pretty basic but they manage to convey a really lovely curiosity with how they crane their heads and potter round sections of the terrain. This one seems to be more about capturing the right shape than a particular type of seahorse but maybe it’s based on a golden yellow slender seahorse. The fish on the right – the white one with the purple and orange face reminds me of a fire goby even though it’s missing some key features and has a slightly different colour palette. The orange and purple colouring is more like some of the dottybacks I’ve seen in my various aquarium travels. There’s an excellent barnacle crust on some of the surfaces. Barnacles have amazing larval stages which look so alien and weird. I always forget that they’re related to woodlice and lobsters because they’re far more similar at first glance to limpets. The Berkeley website has a cool piece about how limpets and barnacles look superficially similar but it’s due to convergent evolution rather than close shared ancestry. The jellyfish peppering the terrain are moon jellies. If you’re in the UK you might have seen these wash up on the beaches from time to time. 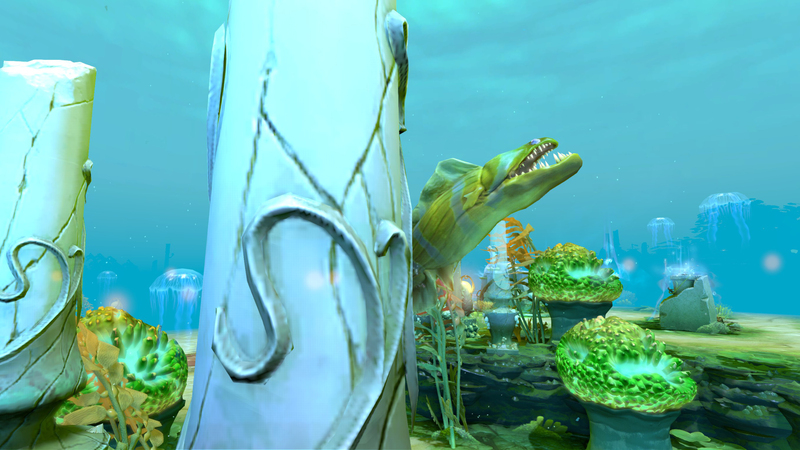 They’re also one of the genera you see a lot in aquaria. There are a few species contained within the Aurelia genus and they look pretty similar so I’m just going to assume Valve’s artists looked to the genus for their inspiration as a simple but recognisable jellyfish template. You see variations on the basic moon jelly look in a lot of underwater games – I’d say it’s the default gaming jelly, at least partly because it doesn’t involve any overly complicated spiralling arms or whatnot. There’s a mussel in between two giant clams here. 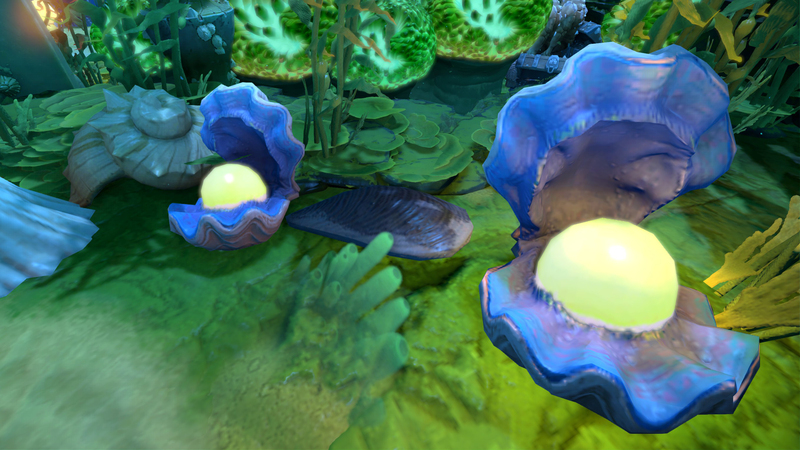 The clams on the map all contain pearls which is something of a fantasy as I think clams only make pearls rarely – hence they’re pretty valuable. As the pearls are being produced by clams they would be non-nacreous which means that they don’t have that iridescence you usually associate with pearls. I think you used to not be supposed to even call them pearls from a gemology standpoint but nowadays you call them non-nacreous pearls. Here’s the listing for one at Bonhams. 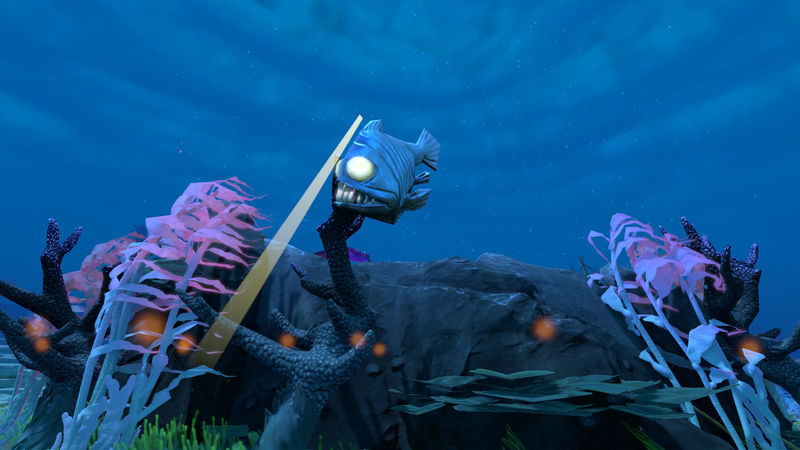 The shaft of light here is actually a character using an ability on the other side of the map but I liked the shot because it made it look like this fish has a little headlamp and is looking for things on the sea floor. 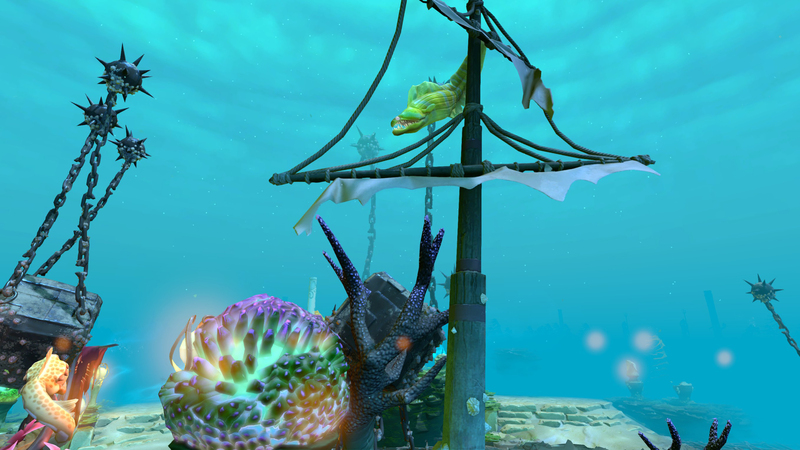 The dire side of the map is more about the darker and deeper sea than the bright tropical shallows so let’s go with the giant hatchetfish here. Hatchetfish do this really interesting thing where they use photophores to emit a low level of light which is intended to disguise rather than illuminate. 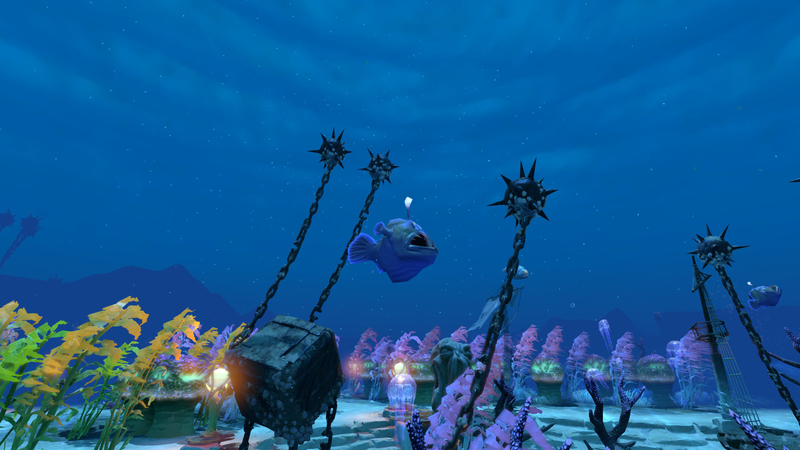 The idea is that the gentle glow means predators can’t see the hatchetfish because the surface of the fish is now matched to its environment. In case you were curious it’s called counter-illumination. 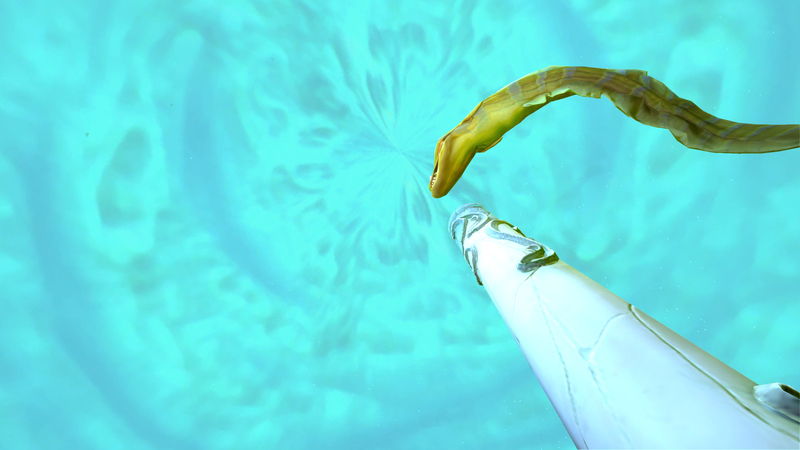 Eel! I love eels so much. They’re daft-looking muscular tubes and I love watching them breathe – it makes them look like they’re having a chat or a little yawn because they’re taking in water to pass over their gills. I assume this one is based on a moray – probably a green moray – but that the colouring and texture has been tweaked so it’s more eye-catching. If not and if it’s based on a real species that would be cool though so if you know one drop it in the comments! Here’s a closer look. I would totally hang out with this eel and we would be really good friends. This is another picture of the seahorses because I wanted to show a bit more of how the move around to give the impression of being interested in their surroundings which is so cute. 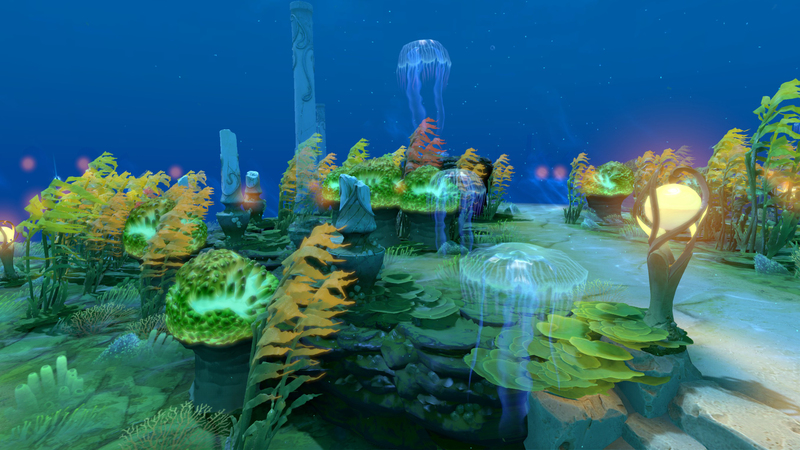 You can also see the way the jellies are sprinkled around the map, hovering over the jungle in their wispy way. LOOK HOW CURIOUS IT IS! Bright-coloured tropical fish are really not my area! I think this one is really pretty and I’m enjoying looking at the fish it *might* be based on. There are some beautiful Aulonocara firefish (a cichlid hybrid) which reflect a bit of the colouring and a lot of the basic shape, and there are some pictures of red spot severum which seem to have some markings in common although the body is the wrong shape. I’m thinking that the cichlids are the best reference point I have so far. 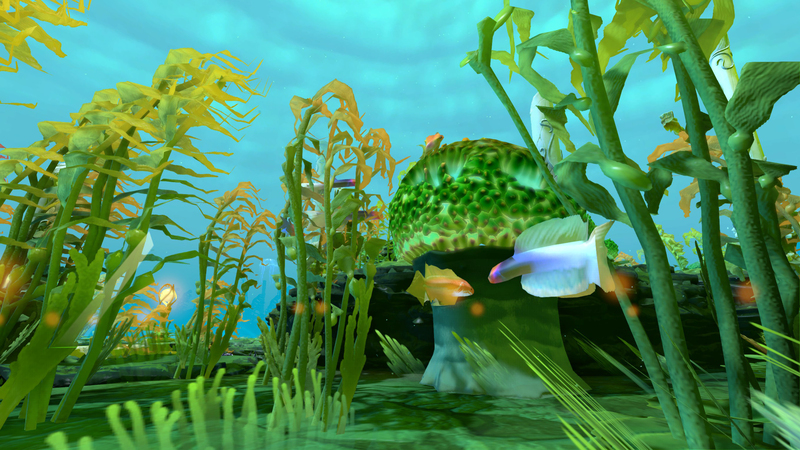 You can see the purple and orange fish from earlier here as well as a bit more of the scenery. I love how cranky the bottom fish looks with its narrowed eyes. I’m wondering whether these are based on anything in particular. 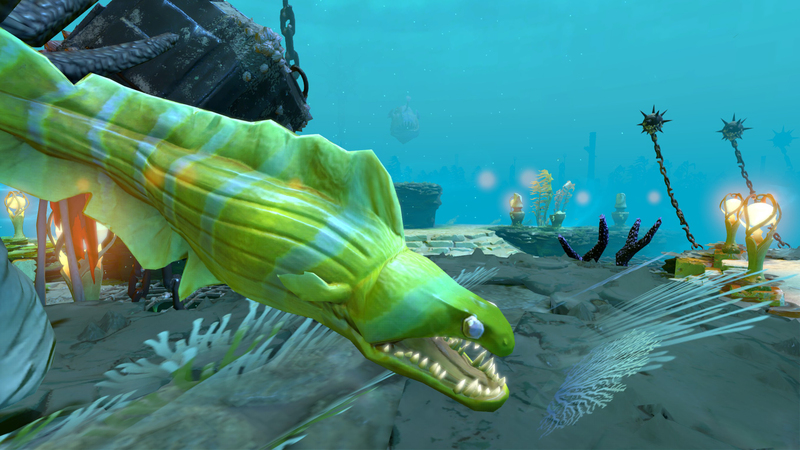 No shade to Valve’s artists, it’s more that orangey fish of this kind feel more like the way you envision fish in that generic “this is a variant on a goldfish I’ve been drawing since childhood” way, you know? Like how a house has a chimney with smoke coming out and a triangular roof and square windows, even if all the houses you know in real life have central heating and rectangular windows and a trapezoid roof. Is that fair or would you like to venture a specific reference point? This is just a screenshot that came out really nicely. 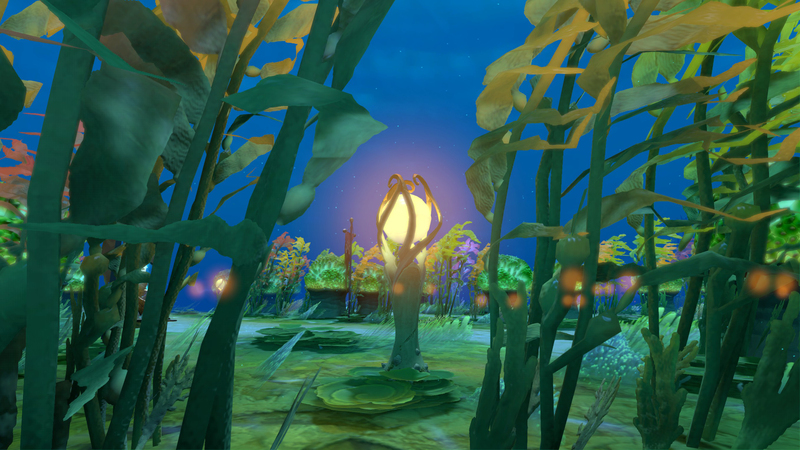 I was poking around in the kelp forest of the radiant side at night and turned back to leave when I found this view. A familiar face here but instead of writhing around the disintegrating masts of shipwrecks on the dire side, the radiant eels wind themselves round broken pillars covered in sinuous designs. Nearly at the end now! 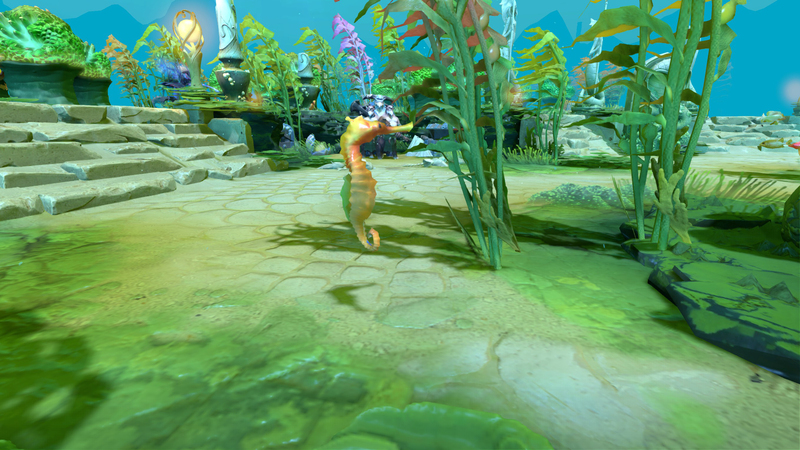 I found this seahorse when I was checking out the area where the banners hang. 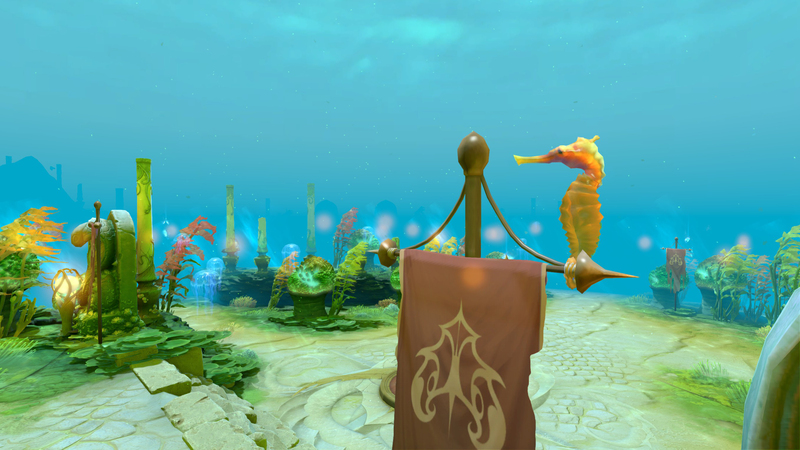 In the regular Dota map these have birds perched on them but here it’s a seahorse with its tail curled round to moor it. When I go to the local aquarium I spend a lot of time watching seahorses as they curl and uncurl their tails to hang on or let go of things in their environment – netting, plants, other seahorses… In the latter case you can end up with these charming tangles of tails and they try to figure out what’s gone wrong. Last one! 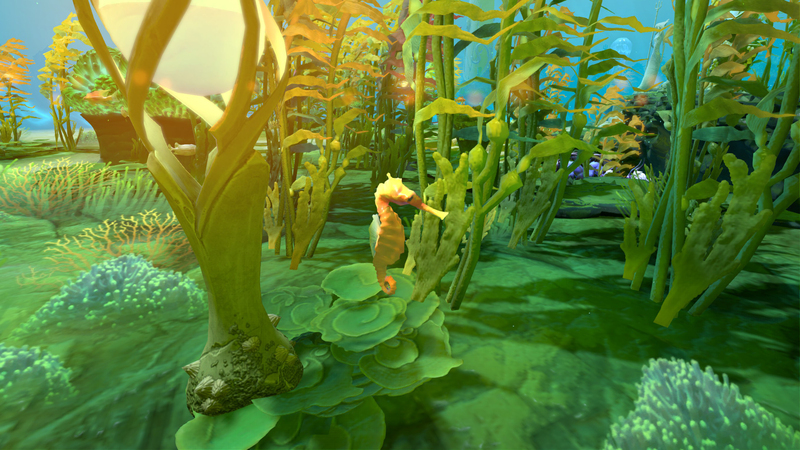 This is the same seahorse but by night and with more of the underwater plants and set dressing in view so you get more of a feel for the overall effect. 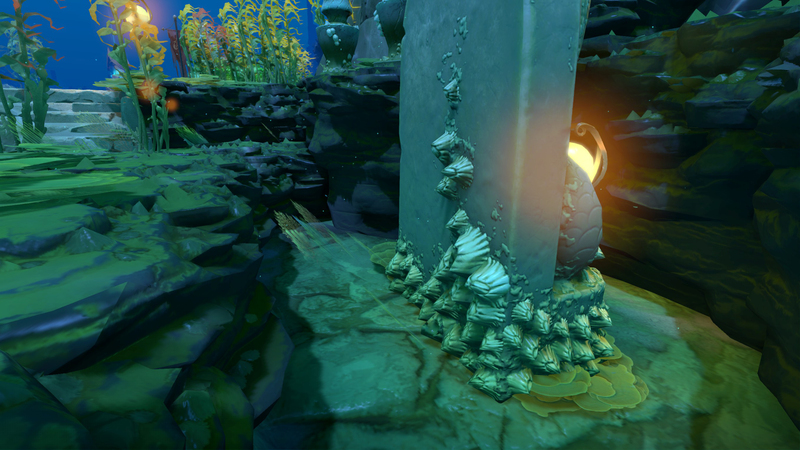 Tagged with Valve Software, Dota 2.